Cat Chat With Caren And Cody: "Easy" And "Awesome" Like Sunday!! "Easy" And "Awesome" Like Sunday!! I remember the first time I read about "Easy Like Sunday" in the blog-o-sphere, it was on the charming and loving blog Brian's Home! From that moment on I was hooked! It is only fitting that today I would post the precious bumper sticker that Cody and I were lucky enough to receive in the mail this week from none other than Brian's Home! We are proudly displaying it in our kitchen along with Alex's bumper sticker from Feeling Beachie! 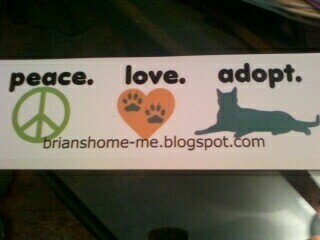 Cody and I love how this bumper sticker made by Build-A-Sign reflects the essence of Brian's blog purrfectly!! Thanks so much to Brian for sending it to us!! Now.... on to the "Awesome!" Wow are Cody and I ever flattered!! Thanks so much to CindyLu'sMuse for presenting this "Awesome" award to Cat Chat!! Cody and I think you are pretty darned "Awesome" yourself! One of the requirements that I must complete in accepting this reward is to tell 7 things about myself. Last time I mentioned things about me, this time I would like to mention 7 things about Cody! The day I adopted Cody I actually wanted to adopt his sister or his brother but not Cody (yes I am ashamed that that is true!) Wasn't meant to be. His sister and brother didn't like me at all. Cody is also quite brave. When someone he doesn't know visits our home, his Sheltie-brother, Dakota, stands BEHIND Cody waiting for Cody's approval of said visitor! Cody is an incredibly good brother to Dakota. They play together and kiss each other every day. Cody doesn't like to sleep with my husband and I at night (he is totally different than most cats in that way) He prefers to sleep in the living room with Dakota. Cody helped begin the healing of my aching heart after Bobo had crossed over The Rainbow Bridge. I adopted Cody two weeks after Bobo had passed. I couldn't bear to live without a cat, and I am convinced that Bobo sent my loving and cuddly Cody to me to help ease my pain. 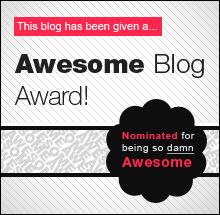 Another requirement of this award is to present it to 15 blogs that I think are "Awesome". For those of you who follow this blog regularly, you know me well enough to know that I simply cannot choose just 15 blogs that I think are "Awesome". If I follow you and comment on your blog, I already think you are "Awesome", if I didn't, I wouldn't be following you or commenting. It's that easy, that's how I roll. So, if I am a follower of your blog or you see a comment from me in your feed, please accept this "Awesome" award "with love, from ME to YOU!!" Congrats on the award!! My kitties have helped me immensely while I'm grieving for my daughter who passed in 2007. Kitties are good for that. Oooohhh.....pawesome! I agree 500% that Cody is handsome. purrr....meow! - I can't believe Dakota, stands BEHIND Cody..heh..hee..you are my hero, Cody. Yesterday I just watch cat attack Rottweiler in Youtube. Now it confirmed by you, Cody. Cats are brave ! - The last one, impressed me and my mom. Because most of people lose their cats, they can't adopted cats any more. But you mom can ! Please don't take us wrong. We adore what your mom done. Because just only cat person will adopted cat. And your mom done a lovely thing,she gave a chance to another cat to have forever home...and that's my buddy..you ! Cody ! We love you both and I think today is AWESOME ! An awesome award to an awesome blog, the blot lady and Cody! Many thanks for passing the award to us too, Tee Hee!!! We know we're awesome too (very cheeky, right?) LOL!!! Those stickers are so cute and beautiful!!! Lucky you!!! Awwwwwww Cody is absolutely lovely!!!! And so is gorgeous Dakota!! And the pic says it all really!!! It's so sweet to see these two gorgeous furblings get on so well!!!! @Old Kitty thank you!! Oh yes they love each other! (too much!) The award is YOURS too! xoxo Hugs to you and Charlie! ConCats on your award! We all think you abd Cody are pretty derned awesome, too! My sweet grey boy Dusty pased from heart failure at the young age of seven and I'm convinced that he sent Rupert to our house. Rupert and Dust are so much alike in color and temprament it's spooky. So I totally believe Bobo picked Cody for you! Congrats on your award! I can't believe that Cody's siblings didn't love you... Alex sometimes likes to sleep with us, and other times, not so much. We got home last night from FL and he didn't leave our side once all night long! I am SO glad you got this well deserved award and Cody? You're welcome in my nests throughput the house ANYtime you want to be here. Mommy too. Congratulations on your award - it's always interesting to read other cats answers!! I'm so glad you like you bumper sticker and that we found our way to each others blogs! Congrats on the cool award too and I really enjoyed learning so much more about your sweet Cody!!! Congrats on the award :-) Dogs and cats getting along are cool, ours always did when I was a kid. Our Irish Setter, Brandy, would always curl up with our calico tortie Pepsi. Me thinks yous and Cody are both Awsome! !Cody is my kind of cat! @Hannah and Lucy thank you! It is for all of you as well! @chocolate angel, (I LOVE your name!) Thanks so much! Awww you had an Irish Setter named Brandy? We had a boxer when I was a very little girl named Brandy and she was a great dog! I am so sorry about your husband's kitty (Baby) passing in October ((((hugs)))) I sooo know how you all feel, I felt the same as him and that is why I adopted Cody so soon after Bobo had passed. So glad you have a new kitty! "Bazinga" what a cool name! Thanks so much for visiting today, so happy to meet you! 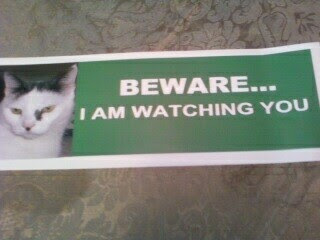 @Brian, I LOVE the bumper sticker and I am so glad to have discovered your blog and your wonderful kitties!! Go ahead and grab the award, it is for all of you too!!! Hope you are having a great Sunday! @Mumsy thank you soooo much! Awww you totally make me smile! The award is for YOU as well! Grab it! (((((hugs)))) to all of you! @Amin thank you! You can grab the award too! Aww, thanks Caren and congrats on your award - SO well deserving!! What a gorgeous little image of Cody and Dakota. I'm so pleased Cody was able to help with an aching heart after Bobo passed. Thanks for the lovely human feelings you convey on your blog. Big hug and lots of love in return. Congrats on the award. We enjoy your blog and we agree that the bumper sticker reflects Brian's blog well. Congrats on your pawsome award! It's funny how you found Cody, even though he wasn't your first choice. This is such a great award, and you truly do deserve it! Cody sounds like an awesome kitty -- he's got that great mix of friendliness and feistiness. I feel, too, that my Domino was sent to me shortly before my beloved Tommy died. I hadn't planned to get her -- it was a spur-of-the-moment rescue, but she helped me through a bad time, too. @CCL Wendy thank you!!! Please grab it for yourself because YOU deserve it too!! Cody is definitely "friendly and feisty!!" My Angel Bobo was only friendly to those he knew well....he was very shy and Cody certainly isn't! @Jan thanks so much! As I mentioned please grab it for yourself as well because you definitely deserve it! I am happy that you enjoy the blog, that makes me smile! Concats on your award and the great stickers. That is a lovely picture of Cody and Dakota together. Congrats so much on the award!!! You certainly deserve it. :D Your wonderful personality really shines through in your blog. Also I really just want to say Thank You for your comment on my blog today. It really lifted my spirits. I guess people interpret things differently than others. I breathed a sigh of relief knowing you a crazy cat-lover yourself had thought the vid was silly and innocent, like I did. :) Thanks again. I enjoyed reading seven things about you! You are a very special kitty and I love visiting your blog. What a sweet story! My Human 'dopted me only three days after Clarkie gotted helped to the Bridge. When she came home, she just could not stand the emptee house. At first she felt a little guilty that she 'dopted a kitten so soon, but the wise people at the vet's said Clarkie would be happy that he had been such a good boy that the Human could not stand to be without a kitty. 'Course, the Human didn't really know what she was getting herself into when she 'dopted me--Ha ha ha ha ha! Congrats on the award! I love reading about Cody! Concats on the award! Cody sounds like he was in the right place at the right time - for him and you. Nice writeup. @Eric and Flynn thank you! Please grab the award for yourself too! I am so lucky to have such cute bumper stickers! I love that pic of Cody and Dakota too, thanks! @Au and Target, thank you! Please have the award as well! Yep I guess Cody and I were both in the right place at the right time, thanks so much! @Pup Fan thank you! Please accept it from me to you as well! @Yvonne awwww thank you! As I am saying to everyone please take the award for yourself! Thanks for enjoying reading about Cody! @Spitty you TOTALLY understand. I am so sorry about Clarkie, but I was just like your Mom. I couldn't stand the empty house (there was no Dakota at that time) and I hadn't lived without a cat for 18 years. I love what your vet said that "Clarkie had been such a good boy that you couldn't stand to be without a kitty", that was something similar to what my vet said (in addition to what I mentioned above) He also said that Bobo would want me to give the same love to another kitty that I had given to him. You totally "get it" ((((hugs))))) I am sure Clarkie is looking down proud and with love! @Shawn, thank you! Please accept it for yourself as well! Cody and I are so happy that you enjoy visiting, it means so much to us! We enjoy visiting you too! from another catlover who can not live without her furbabies. @Dori thank you! Nice to meet you! I am looking forward to getting to know you and I am thrilled that you stopped by! Yay!! Congratulations on the award! You deserve it! Love your blog! @Denise thank you so much! Feel free to grab it for yourself too! I am thrilled that you love my blog, I love yours as well! Yay! Congrats on your award! Theese is excellent! It doesn't surprise me that Cody is such a brave one...Good on ya, my man Cody!